Immerse yourself in an authentic, Aboriginal cultural experience like no other. Through hidden rock art, unravel the ancient stories of the Kuku-yalanji people to learn more about Australia’s Indigenous history. Visit the pristine and culturally meaningful 'Magnificent' rock art site, where you’ll be personally guided by Traditional Owners through an unforgettable journey through what archeologists say is a 20,000-year-old outback museum. Prepare to feel a world away from home in the remote backdrop of Cape York Peninsula. Access to the rock art site are only available via an exclusive four wheel drive adventure track or helicopter tour and found only among the sandstone escarpments near the small town of Laura, North Queensland. Discover Kuku-yalanji people’s connection to country through a journey sampling native bush tucker, bush medicine, how their old people survived for thousands of years, to learning about the rejuvenation of land as you walk on country. Your overnight stay will have comfortable camping options, roll out a swag or cosy up in a tent with beds that will make you forget you’re camping. The Quinkan Rock Art is one of the best on the planet. It is outstanding for its variety, quantity and quality, an absolute must see! 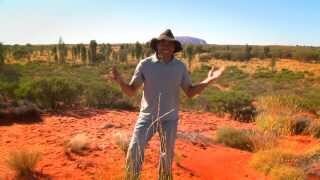 Jarramali Rock Art Tours takes you to Quinkan Rock Art that is one of the ten most significant bodies of rock art in the world! Leaving Cairns you will receive onboard commentary about the region and its past. On arrival at your destination you will have lunch on a sandstone escarpment at Johnny’s bush camp. You will be welcomed to this area with a welcome to country and accepted by the smoking ceremony. Your interpretive guided Rock Art Tour will take anywhere from one hour to one and a half hours. Depending on how many questions you ask and how much you put into it! Following the guided tour you will have some free time to wonder and explore the country or just enjoy the scenery at the lookout. In the meantime your camp oven roast will be prepared for a scrumptious dinner. Then its billy tea and damper and yarns around a camp fire. On waking up the next morning, you will enjoy a lovely hot breakfast and shortly after you will return to Cairns/Port Douglas to your respective destinations!